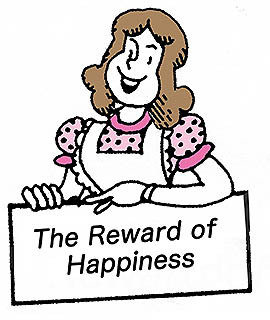 Whenever a person does something good, a reward is bound to come. Sometimes it takes years. Sometimes great sufferings must be endured. But perseverance in working for a good cause is bound to lead to the reward of happiness. Mrs. K. is a case in point. The man she married had four children, ages one to seven. Their mother had died and for several months the father had tried to care for them with the help of his sisters. Then he remarried, and Mrs. K. came into the family. The children resented her from the start. They seemed to look upon her marriage to their father as an insult to their mother. And they rebelled against the idea of having to share the love of their father with this new woman. Mrs. K. cried herself to sleep many nights at the thought of the children's dislike. But she did not give up. She did everything for the children that they would allow her to do. And when times got hard and financial difficulties arose, she took a part-time job to supplement her husband's salary. The children gradually began to understand and began to show more friendliness toward their father's second wife. Still, they obviously did not look upon her as a mother. And this hurt. Then one day, as Mrs. K. sat mending clothes, her eyes filled with tears. Tears of happiness. She would never again feel rejected by the children. They were sitting outside the window, and she heard one of them say, "We are sure lucky. We had two mothers! One who gave birth to us and one who raised us." The other children expressed their unanimous agreement.